Patrik Baboumian (Persian: پاتریک بابومیان‎, Armenian: Բադրիք Պապումեան; born 1 July 1979) is a German strongman competitor, strength athlete and former bodybuilder, also known as a veganism promoter. Born in Abadan, Iran to Armenian parents, at the age of seven Baboumian, along with his mother and grandmother, emigrated to Hattenhof, Germany. By the age of nine Baboumian had developed an interest in weight training, which led him to pursue bodybuilding as a young man. In 1999 he won the IFBB German junior bodybuilding championship, and in 2002 he became the overall junior champion at the Gießen Campions-Cup. Baboumian currently holds the world log lift record in the 105k-category (165 kg), as well as the German heavyweight loglift record (180 kg) and the title of "Strongest Man of Germany" (105 kg division). Since 2006 he has been competing at IFSA Strongman events. In 2007 Baboumian competed at the FSA -105 kg World Championships and ended up with a 14th place. Baboumian has held the log lift World Record (-105 kg division) since 2009. He lifted 162,5 kg in his second attempt in the German log lift nationals 2009. 2010 Baboumian also set a new German heavyweight loglifting record with 180 kg. 2011 Baboumian competed at the loglifting world championship and placed 4th with a new German overall-record of 185 kg. On 21 May 2011 he lifted 190 kg in Turku, Finland winning the local competition. 2011 Baboumian also won the title of "Germany's Strongest Man" by winning the open division at the German strongman nationals. On September 20, 2015, Baboumian beat his own world record by completing the yoke walk with 560 kg in Kitzcher, Germany. Baboumian has been a vegetarian since 2005, and became a vegan in 2011. In November 2011 Baboumian became the new face of a campaign by the animal-rights organization PETA, advocating a vegan diet. ^ a b "Vegan strongman shoulders 550 kg — a record, perhaps — at vegetarian food fest". Toronto Star. 8 September 2013. Retrieved 6 February 2018. ^ "Vegan Strongman Patrik Baboumian Breaks His Own World Record!". Retrieved 2016-07-17. 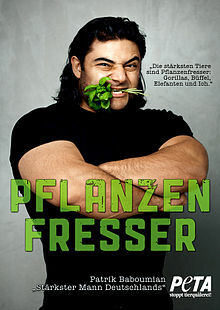 ^ "'Strongest Man' Eats Plants, Loves Animals". PETA. 21 November 2011. Retrieved 6 February 2018. ^ Deutsche Strongman Meisterschaft 2011. 8. August 2011. ^ Flashreport Deutsche Strongman Meisterschaft 2011. Wettkampf Bericht von Body-Xtreme. Abgerufen am 8. August 2011. ^ Patrik Baboumian wird Europameister Raw-Powerlifting EM (GPA) in Finnland . Wettkampf Bericht abgerufen am 10. Juni 2012. ^ Zeitungsbericht Hamburger Morgenpost – MOPO. Abgerufen am 19. August 2012. This page is based on the Wikipedia article Patrik Baboumian; it is used under the Creative Commons Attribution-ShareAlike 3.0 Unported License (CC-BY-SA). You may redistribute it, verbatim or modified, providing that you comply with the terms of the CC-BY-SA.